CLICK HERE for a collection of recent abstracts indicative of the kinds of research and creative work pursued by Honors Program students in their thesis project. Development of the thesis continues into the senior year in a sequence of courses totaling four credit hours. HON 4V87, Honors Thesis, is usually taken during the final two semesters. As a variable hour class, student must register for the class and total number of credit hours, usually two hours each term. In HON 4V87, students are expected to draft substantial sections of the thesis essay, often around half the thesis during each semester. The first section of the essay is quite often a review of the relevant literature, explored in the Readings courses, that places the thesis in the context of current scholarship. Subsequent sections then proceed to analyze primary sources, data, or laboratory results. At the conclusion of the project, the completed thesis is presented by the student and evaluated by a committee of at least three professors in a one-hour oral defense. The Honors Program provides a set of specific guidelines and recommended procedures for every phase of the thesis project, but each thesis director may opt to modify the requirements of any thesis course at her or his discretion and evaluate the student's progress accordingly. Click here to go to the Thesis Formatting Guidelines page (located under the Resources for Students web page) to find out more about the thesis project undertaken during your junior and senior year. Questions should be addressed to Dr. Al Beck, Advisement Coordinator of the Honors Program (254-710-6470); or to Dr. Andy Wisely, Director of the Honors Program (254-710-1119). Honors juniors and seniors develop thesis projects under the close supervision of faculty mentors. 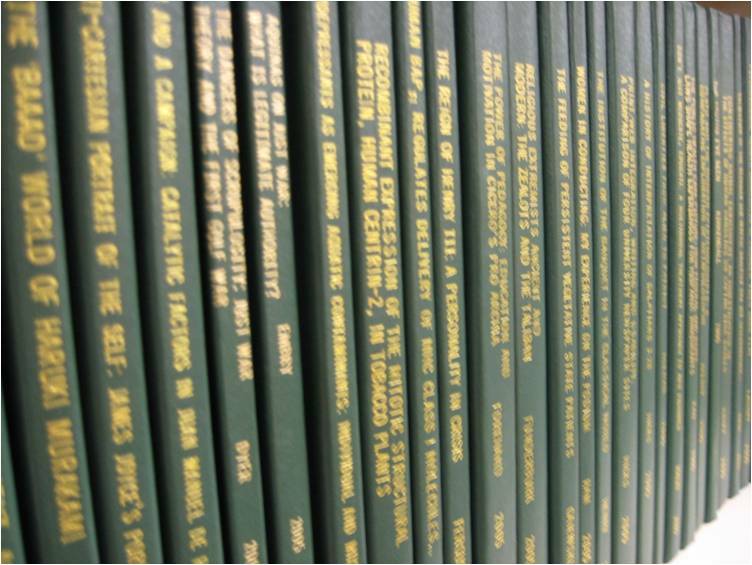 Students already working on their projects may want to applaud their faculty directors' work: one medium for such applause is The Pulse, Baylor’s undergraduate scholarly journal, which welcomes recommendations from students for faculty to be honored with its monthly faculty feature. See online recommendation form here. Students who are beginning their thesis projects may want to consult the list, organized by academic discipline, of faculty who have recently directed Honors theses. The final steps of the thesis involve submitting a paper and electronic copy of the defended and revised thesis to the Honors Program office. The paper copy is submitted in the Honors Suite, but the electronic copy must be submitted online. Detailed instructions can be found at https://www.baylor.edu/honors_program/beardocs. The following documents should prove useful to students and their faculty mentors as the work through the thesis project. This document provides a broad overview of the steps necessary to complete a thesis, with some discussion of how different theses may vary by subject area. This document explains the purpose of junior-level Independent Readings & Research hours and describes what is expected of students and faculty. Independent Readings & Research is the preliminary step towards the writing of the undergraduate Honors thesis. This explains the purpose of and prerequisites for the senior-level Honors Thesis hour and provides a general timeline for producing a thesis over the course of the year, as well as expectations for formatting and procedures for grading. This form is submitted at the end of HON 3101 and before beginning HON 4V87. Once filled out, it will be signed by both the student and the student's thesis director before submission. This document provides important dates and expectations for the thesis project. Honors students generally received a copy of this syllabus at the start of their thesis-writing semester. Students should provide a copy of this form to their thesis mentor when they schedule their oral defense. On this form, one can find helpful information regarding the nature and expectations for the concluding thesis defense, usually conducted at the end of the semester once the thesis has been reviewed by the faculty mentor. Deadlines for current-semester graduates (spring and fall terms) are referenced in this document. See above for information regarding this form used at the oral defense. The web page https://www.baylor.edu/honors_program/beardocs links four documents that provide step-by-step instructions for submitting the final electronic copy of the thesis to BEARdocs. Note that this must be completed before a student will be cleared for Honors Program graduation.